A few days ago a $400 charge hit my credit card and Amazon notified me that my 21.co bitcoin computer was on its way. Essentially a Raspberry Pi connected with a custom bitcoin-mining ASIC and a heatsink, the computer is one of the most interesting MVPs in modern memory. While you could easily recreate it yourself, the fact that 21 is building and selling these for a few hundred dollars is a testament to the future widespread adoption of BTC systems. Is it worth it? First, I doubt this 50 Gigahash per second machine will ever earn back the cost associated with buying and running it. Second, it’s very cool but I suspect that this isn’t quite the bitcoin droid we’re all looking for. That said, I would argue that it’s a fascinating proof of concept. The 21 computer is essentially a version of previously-built Raspberry Pi miners. I’ve run something similar to it under my desk for about two years now and it’s been a fun if impoverishing experience. Heck, you can buy this monstrosity for $60 and heat your bedroom while you mine pennies a week. But you don’t mine bitcoins to for the riches, people say. You mine it to support the network. Ultimately the 21’s goal is to put something like this bitcoin system into every phone and computer. This move would change the way the blockchain is processed in a very real way and could result in some interesting changes in the entire ecosystem. As it stands, however, this computer is akin to Baby’s First Bitcoin miner, a plug and play device that is accessible and understandable and a great way to get into mining without going crazy. What this device is really designed to do is offer a test bed for bitcoin-based activity like sale of signed digital goods, the ability to rent out system time for bitcoin, and accept bitcoin on a commerce site. The core app is called 21 and it runs from the command line. 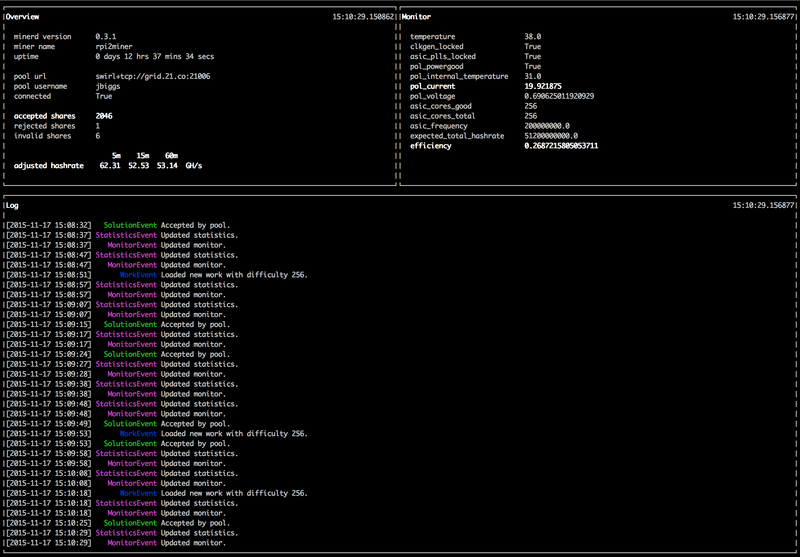 Typing ’21 mine’ activates the bitcoin miner while other commands activate various features. 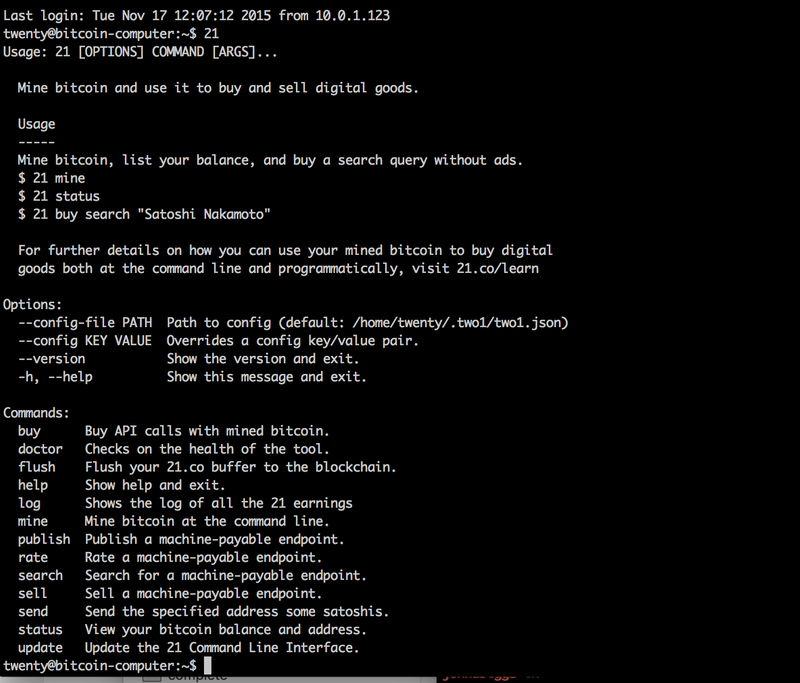 You can also launch a server to perform basic bitcoin functions. For example, 21 offers a bitcoin via SMS system that uses Twilio to send payments. You can also sell digital files via bitcoin using this server. So why run this other than a testbed? In the words of one Reddit user, Tequila13, “There’s vision of a future where every phone will have a mining chip, and people out the goodness of their heart will pay for the mining chip and will mine at a loss for the greater good. A future where millions of people will buy the phone with the lower battery life, because they believe in bitcoin.” While this is a bit Utopian, it’s true: if millions of these mini miners powered the bitcoin network it would be a far more interesting world: bitcoin would move more quickly and with more surety, the rates would ideally stabilize, and the blockchain would be a force to be reckoned with in finance. In short, this is the Internet for money and, like early Internet servers, it seems quite limited right now – until, suddenly, someone builds the financial equivalent of Google Docs in the browser. The 21 bitcoin computer is a platform for experimentation. It is a clever hack, a nice MVP for the company, and a great way to get started in Bitcoin. You could quite easily recreate it on your own but without the specific software and server stack that they’ve made available I doubt you’d have the same out-of-the-box satisfaction. When I built my first miner it took a few days to figure out the pieces and software. To run this miner I simply typed “21 mine” and I was off and running into the cryptocurrency future. That, alone, might be worth $400.